State propaganda extends up to the highest levels. Even the profession of dentistry isn’t immune. Below are images from the latest ADA News, September 17, 2018. ADA stands for American Dental Association, the official union bureaucracy for dentistry in the US. The ADA News is their publishing organ. Here’s the roundup, and it’s a doozy. 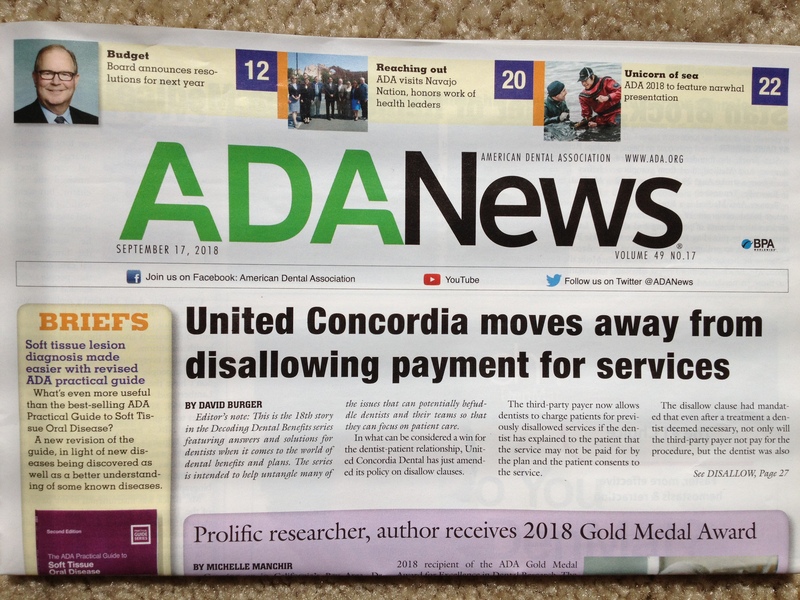 The lead headline in this edition (above) concerns an insurance conglomerate United Concordia, which has been nefariously dictating payment rules & treatment options for working dentists and their patients. It begins with an editorial note in italics that informs readers this is the 18th article [!] in a series on insurance benefits & plan options. Since I’ve suffered through the first 17 installments, let’s skip to the synopsis, which goes like this. The ADA has valiantly & tirelessly fought against this unfair practice, as the wolves have acquiesced for now. Meanwhile they will continue to use all sorts of other dirty tricks to cheat doctors on fees, and patients on treatment options & benefits. That’s the part the ADA doesn’t print. It helps to be able to read in between the lines. 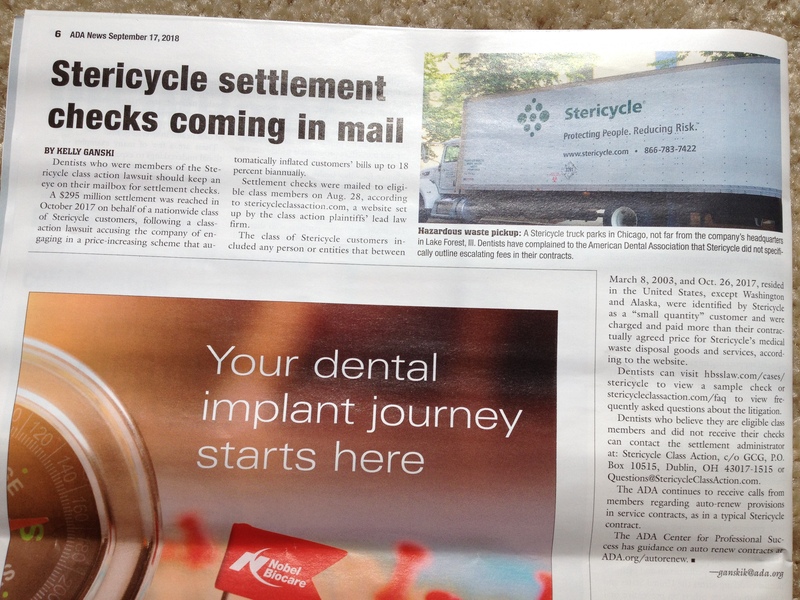 Stericycle is a dirty waste disposal operation that has gouged physicians & dentists for decades. Their model is to buy up all their competitors and monopolize the market. During the time I owned & managed my private dental practice from 1995-2014, Stericycle bought up (at least) 2 or 3 waste disposal companies I was contracted with, until I finally found one that assured me (and kept their promise) that they would never sell out to them. At this point, class action lawsuits (above) are a pittance to working doctors, and a futile gesture by the ADA, whose bureaucracy eats up most of the settlement benefits. When the ADA says the check is in the mail, you know they mean business. That’s how they settle up, and put things to rest. Speaking of rest, above is a dental image of the olden years. You know, the extra years dentists now have to work, because they take home less than ever. 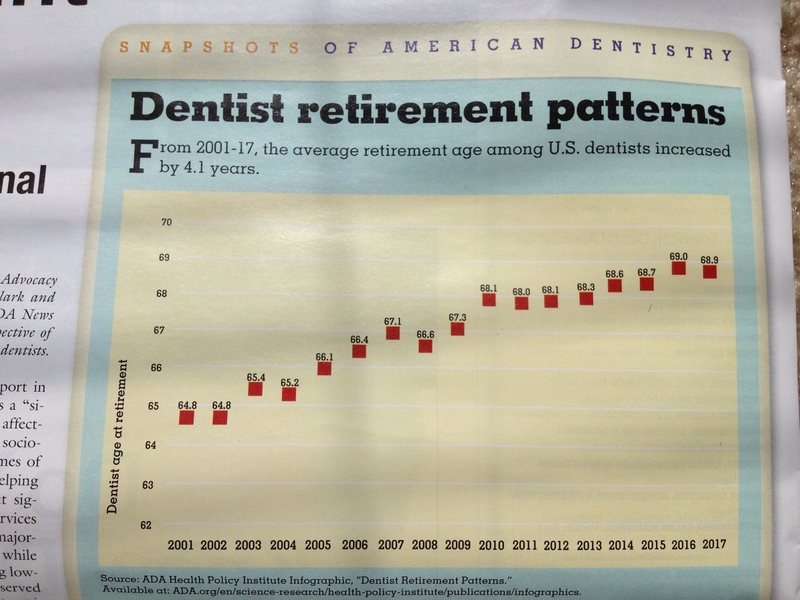 The ADA provides readers with a graph & the numbers, but don’t answer the question: What is causing dentists to have to work more years before retiring? Dentistry was the last profession to be destroyed, and the ADA assisted in the process– to keep itself fat & happy. 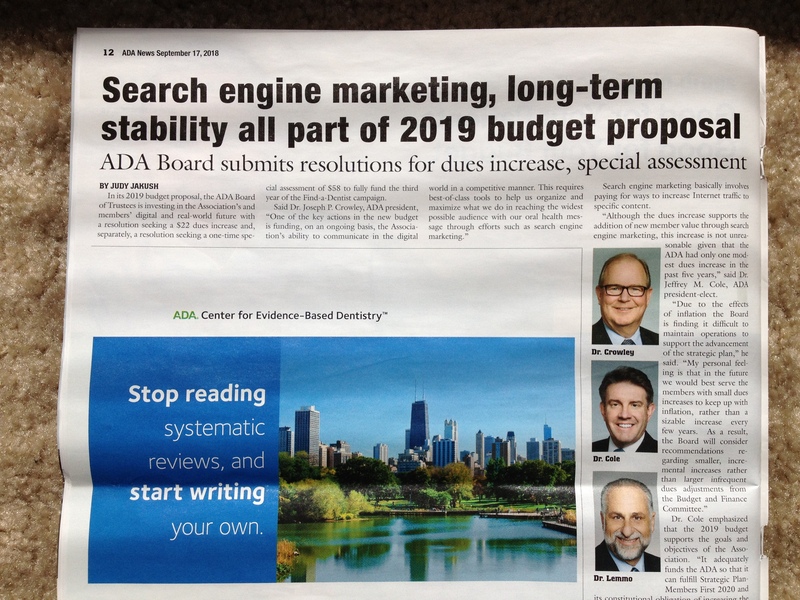 Corporate dental, student loan debt, the economic crash of 2008, the opioid crisis, and insurance conglomerates have devoured dentistry, yet the ADA still trumpets itself as victorious & noble. 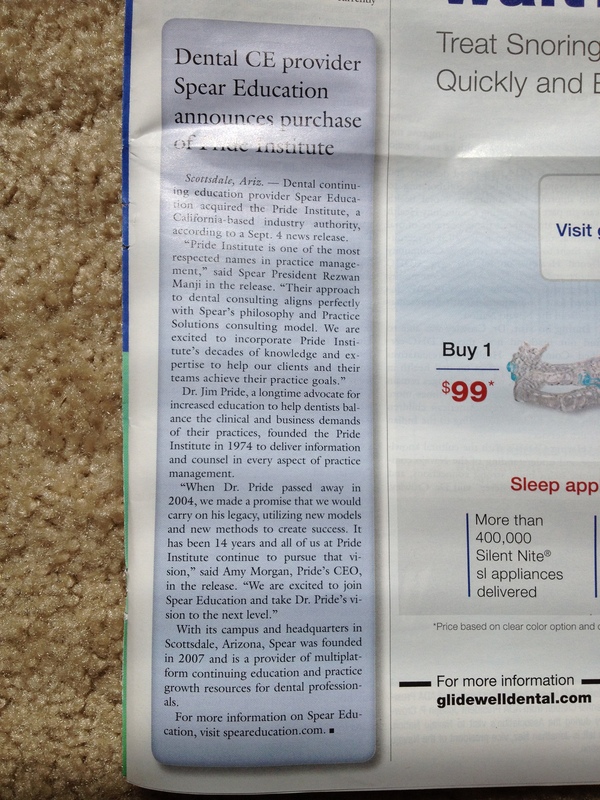 This is why most working dentists toss the ADA News directly into the recycling/trash bin, never reading it as they are too busy for this nonsense. It’s a midterm election year, so the ADA is throwing their best face on public health. 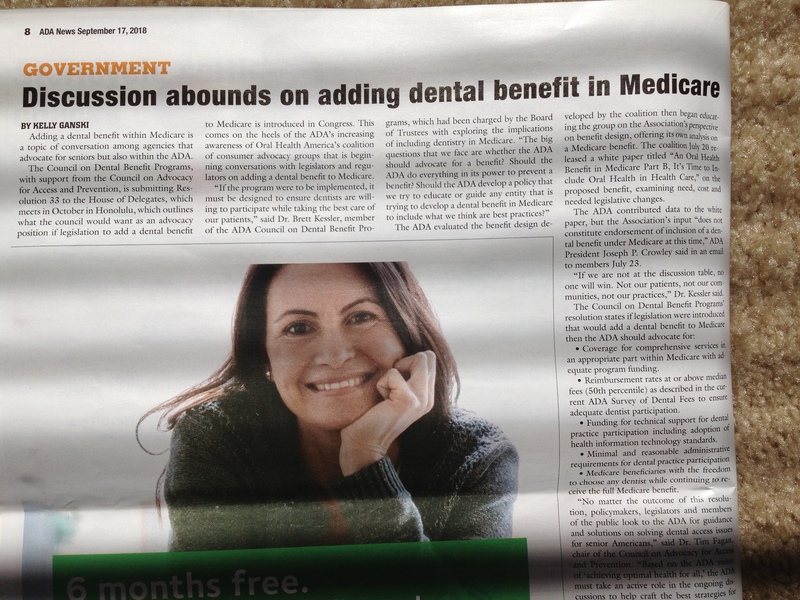 Dental benefits for Medicare will be low-fee, minimal services at best– extractions & dentures. That is, if any of this even had a chance, which it doesn’t. The careerists at the ADA have to at least, look like they are doing something, or give an appearance they care. Remember in November! All I read above is “ADA…dues increase,” just below the big bold headline. This begs the question: for what? I want to say that I’m glad I don’t pay for this, but that’s not true, as everyone pays for this. The glare got this above headline, which reads “Spear Education purchases Pride Institute.” The question is: For how much? The article doesn’t say. It must not have been a lot, otherwise they would have reported it. The Pride Institute was/is a joke, charging dentists who need help in practice management exorbitant fees, acting like they have all the answers with their cookie-cutter formulas; and then $50K-or-so later, they leave the dentist to implement their useless business philosophy. When it fails, it’s always the client’s fault. Total scam. Spear Education must have been feeling ambitious, and decided to corner the market. Here is an example of US military & intelligence agencies funding university research. 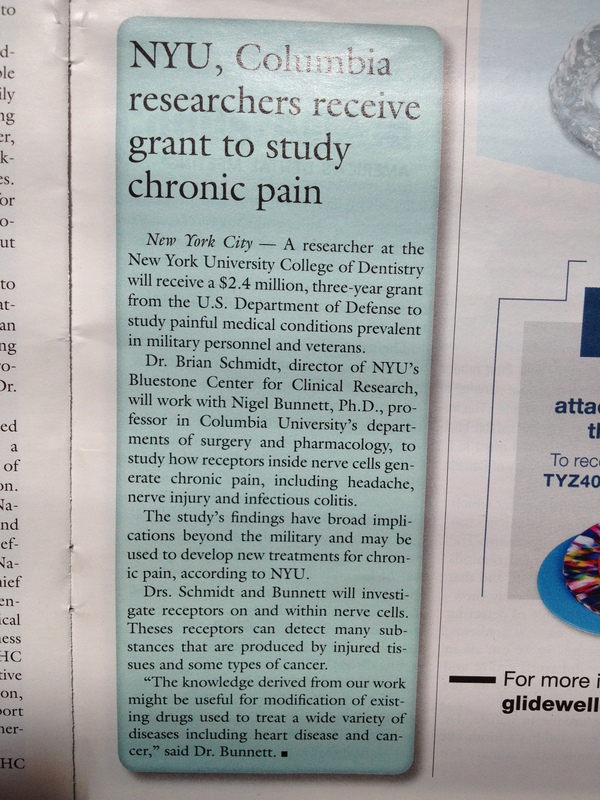 NYU & Columbia have deep state ties, and here it is in dentistry. Look at that grant money!! Boy, I’d like a piece of that, but then again, what do I know? I’m just a working dentist. What’s needed here are connections. 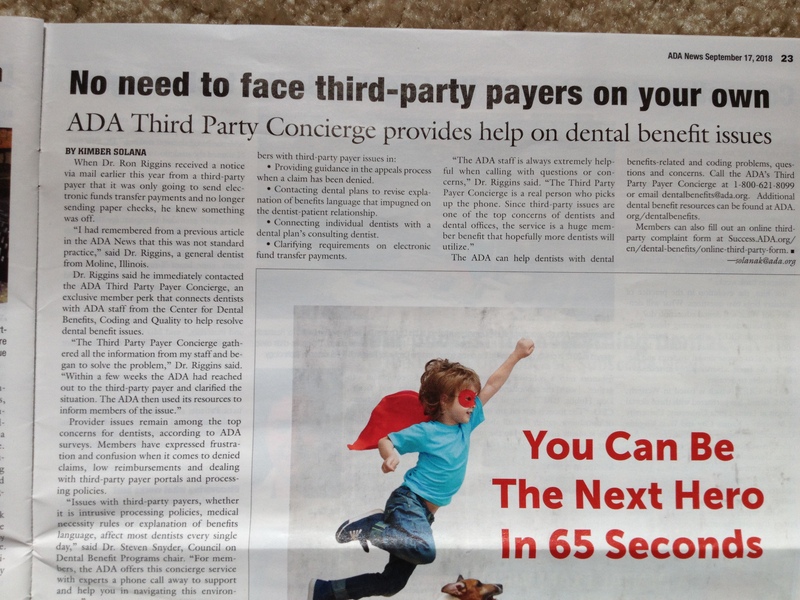 The title above reads, “No need to face third-party payers on your own.” This refers to working dentists who are being systematically ripped off & shortchanged by insurance conglomerates who make all the rules. The ADA is reassuring its constituency that it is diligently working behind-the-scenes on this. Possibly a class-action lawsuit down the road. Stay tuned, as this could become another 18-part series. Until then, no news is good news, and always remember that the ADA has your back. Also, don’t forget to keep paying those dues (which are going up), while you sift through a vast wasteland of low-ball, corporate-crap, “career opportunities” in dentistry. It’s the American dream. This entry was posted in Economics, Film & Mass Media, Politics, RS Content and tagged ADA Corruption, Rockstar Dental Consulting by admin. Bookmark the permalink.